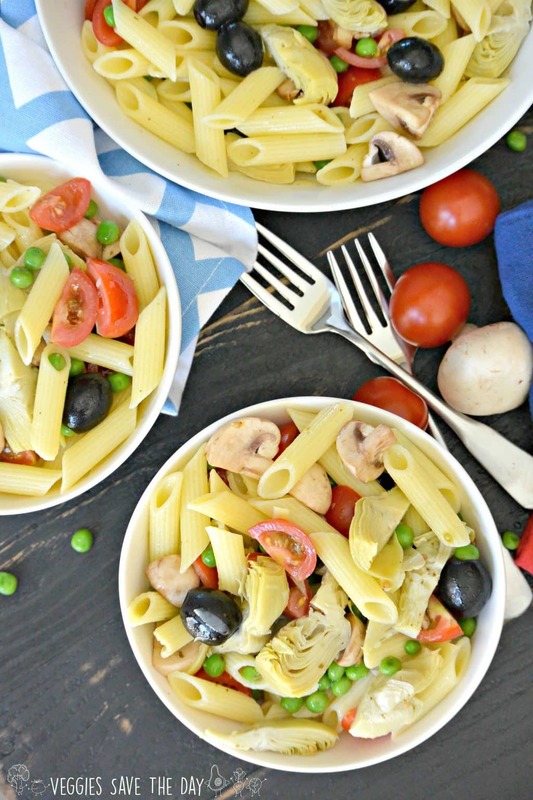 Marinated Artichoke Hearts Pasta Salad is a quick and delicious recipe you can make in under 30 minutes. It’s perfect as a side dish, a main meal, or to bring to potlucks. And this recipe is naturally vegan and can be made gluten-free. I’ve been making this pasta salad for years. The recipe was inspired by one in a Sunset cookbook I owned years ago. Do you remember those cookbooks that were published in the 1970s and 1980s? I had a whole collection of them in the early 1990s. I owe a big part of my love of cooking to them. While I don’t have the books anymore and couldn’t tell you which one contained a recipe like this one, this pasta salad has stuck in my mind for 25 years! 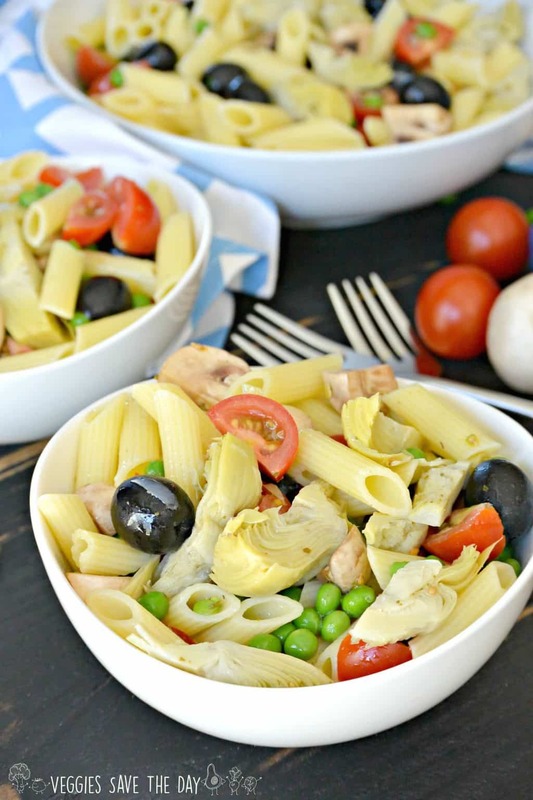 Marinated Artichoke Hearts Pasta Salad is easy to customize. The two key components are the marinated artichoke hearts with the liquid from the jar and pasta. Instead of making a separate dressing, I use the marinade from the artichoke hearts. So for this recipe be sure to choose the marinated variety rather than artichoke hearts packed in water, which typically come in a can. Everything else, including the shape of the pasta, is up to your imagination. 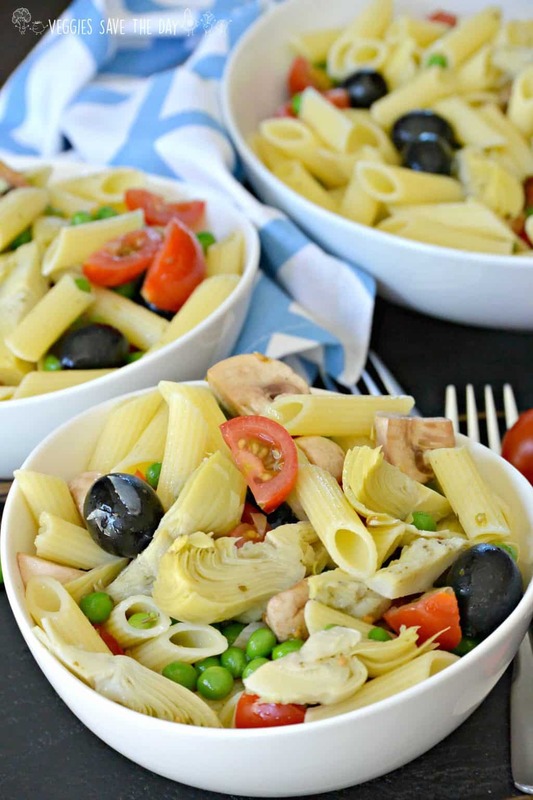 I personally love this recipe with gluten-free penne pasta, peas, mushrooms, cherry tomatoes, and black olives. But you can make it with bow tie noodles, red or green bell peppers, carrots, cucumbers, and green onions. The magic of this recipe is the liquid from the marinated artichoke hearts. You don’t need to use anything else for the dressing. All you do is pour the contents of the entire jar over the pasta and vegetables. The marinade in the jar is a mixture of oil, vinegar, and spices, which is how a vinaigrette is made. In fact, you can use a recipe from Amanda Freitag of Food Network to make your own marinated artichokes at home. Everyone loves a good pasta salad at summer barbecues and potlucks. And this recipe is a great change of pace from the typical mayonnaise based salads. I like to serve it along side other summer salads or grilled dishes. Some of my favorites include Mediterranean Cucumber Salad, Grilled Eggplant Salad with Chickpeas and Tomatoes, and Cauliflower Ceviche. To summarize, this pasta salad recipe is incredibly easy to make. Cook the pasta according to the package directions. Drain and rinse with cold water to cool the noodles. Transfer the cooled pasta to a large bowl. Add the vegetables, marinated artichoke hearts, and the liquid from the jar. Toss well to combine. Refrigerate the salad until you’re ready to serve. 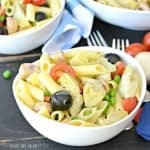 Marinated Artichoke Hearts Pasta Salad is a quick and delicious recipe you can make in under 30 minutes. It's perfect as a side dish, a main meal, or to bring to potlucks. And this recipe is naturally vegan and can be made gluten-free. Cook the pasta according to the package directions. Drain and rinse the cooked pasta with cold water until cool. Place the cooked pasta in a large bowl. Add in the peas, mushrooms, tomatoes, olives, and the marinated artichoke hearts with the liquid from the jar. Toss well to combine. This pasta salad is based on a recipe from a Sunset cookbook from over 25 years ago. I don't know which book I saw a similar pasta salad in, but the dish has stuck in my mind all these years. You can make it in advance and refrigerate it until ready to serve. The leftovers will keep for a few days. What do you do with liquid from artichokes? The liquid from the marinated artichoke hearts is the dressing for the pasta salad. Just made this pasta salad, and the marinate from the artichokes is just right. I added red onion and mozzarella balls, sliced, topped it off with shredded parm cheese!! What a great salad, it’s a meal in it’s self!! Yay! I’m glad you enjoyed it, Jeanette!